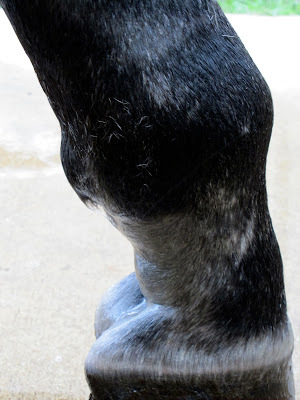 Yesterday afternoon during my visit to the barn for midday cool rinse + watermelon break, I noticed some pretty major swelling in Val's right hind lower leg. Bummer. It was all the way around his fetlock, down into the pastern and above the fetlock for a few inches. It was pretty warm, and the swelling was firm, even tight, feeling. 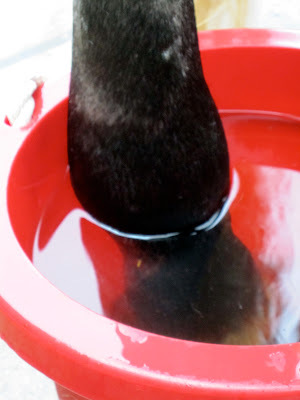 I cold hosed, and got Val to stand in a bucket of nice cold well water for about fifteen minutes. He also got 2g of bute. Early this morning, the swelling wasn't any better - in fact it was possibly a bit worse. More bute, and I rushed up to the barn as soon as I finished work. 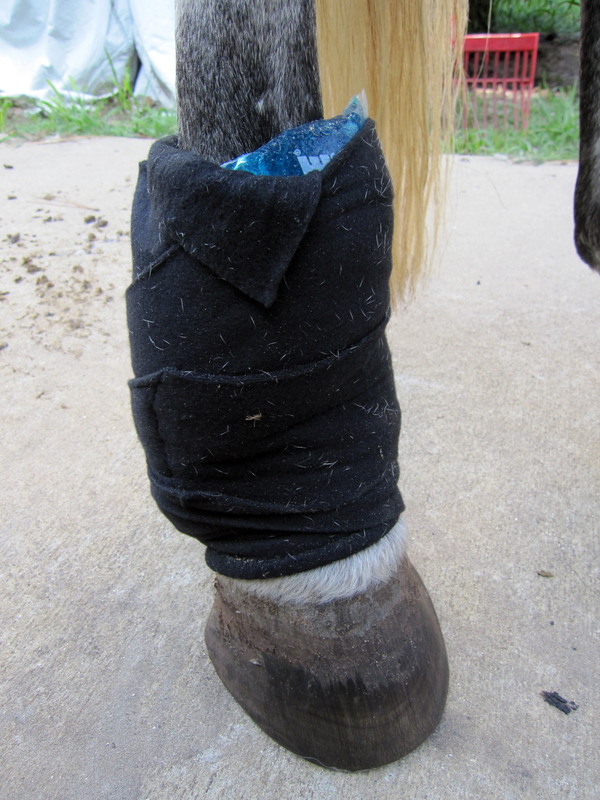 This time I took some of those flexible freezy bags, and polo wrapped them around his ankle. While he chilled out, I groomed, trimmed and clipped. Then I compression wrapped the affected leg, all the while wishing that I had practiced this skill prior to needing it, but I think I did an okay job. We trotted out on level ground to check for lamenes, but I couldn't observe his movement very well while leading him. I need a helper. However, he didn't appear to be off. Also checked his pasterns to be sure they were still at the same angle - check. Big sigh of relief on that one. Stomping flies (they are ungodly bad right now)? Torquing leg in the #^*$%*#@& deep sand? It certainly isn't a result of too much work. Let's hope the swelling has gone down tomorrow morning, otherwise we'll have to plan for a trek to the vet - an all day affair. Besides, it's better for everyone involved (Val) if we limit the bute consumption. It results in such drama. * One could almost be convinced that poor Val will never again enjoy his most favoritest horse cookies. Or even the humblest bowl of horse chow for that matter. After this mornings dose, Val took issue with my having loaded the hay bag with the same hands that touched the dreaded bute tube. He proceeded to deliberately sniff the freshly loaded nibblenet all over. Then he sniffed my hands, sniffed the bag, hands, bag... finally he delicately lipped out about three strands of the offending hay, spun them around in his lips a few times, dropped them on the floor and stepped on them. Another round of sniffing - hay, hands, hay, hands... big sigh. I so hope the leg looks better tomorrow--know all about those all-day affair vet trips and how much fun they are! I often have this problem pop up when we have a thaw and it gets muddy...easy to twist an ankle in that, so my guess is it's probably a combination of footing and Val shenanigans. Ouch! hope the swelling goes down soon. I second the applesauce trick! Hope the leg recovers well; if he's not lame it should be right pretty soon. Sending good thoughts for Val and hoping it resolves quickly. RE: bute - we get apple flavored buffered bute powder from our vet that smells so good I would almost eat it myself! Mine all will take paste if they have to, but Salina has the same reaction as Val - she hates hates hates it. The apple flavored powder is no problem at all. I second the powdered bute! I've seen even the fussiest of eaters take the powdered bute mixed into their grain with a little water. I know my TB hates anything in a syringe: probios, electrolytes, de-wormer, bute... doesn't matter. He acts like it's poison. But, if I mix the contents of said "poison syringe" into his beet pulp, he never even notices it's there. Silly horse! Applesauce is a good idea, anything the mask the flavor. He's so smart and funny with his hay net antics. Gotta love them. Hope the swelling is down and no trip to the vet is needed. Looks like you did a good job on the wrapping. Good luck. 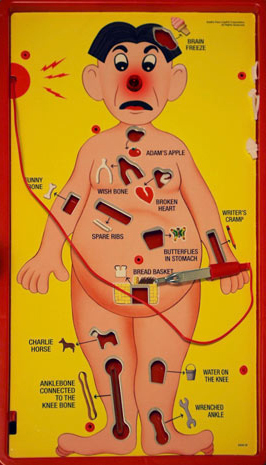 I would have missed the reference without the "Operation" image. Funny! Maybe he stepped into a yellow jacket nest or something like that. 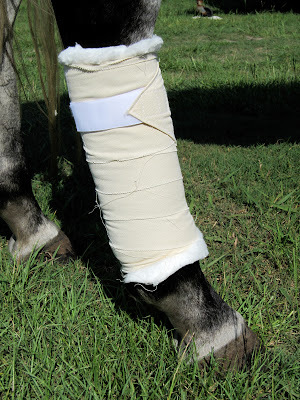 I am not sure if it would stay swelled on a horse over night, but it would on me! If he is not lame than I am sure that he is on the mend. Nice icing job! If he's not ouchy on it, I second Val's wasp or bee sting theory. Seems like there have been a lot of random swellings that folks later found out were stinging insect related. But here's hoping that's ALL it is, and that no trip to the vet is necessary! Poor guy! I hope the swelling goes away quickly. Drat it all C! Mystery injuires slay me(any injuries actually)I am happy that it isn't a lamness issue...maybe he got stung? What ever the case Dr mom is on it..good job with all the vetting..you only get better with need and use. (unless you are me and eye stuff)! Hope tomorrow come and he is right again! 3rd for the powered Bute.I keep a jar of molassas just for that reason. It makes the medicine go , or even apple peels-mare weirdo! I think you did a great wrapping job. Your description of Val fussing over the bute smell had me laughing. They're so funny. Hope the swelling is better soon. I sure hope the swelling goes does and you can avoid a trip to the vet! I'm sorry your boy is ouchy :( but you should ask your vet for some flavored powdered bute. I got some for Gwen when she tore her leg open and she's never turned her nose up at it (she's really picky).